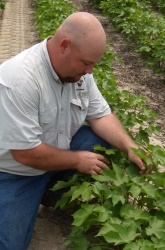 By Darrin M. Dodds, Ph.D.
Summary: This presentation will help consultants, growers, and other practitioners in the Mid-South region. Application of harvest aids has often been called more of an art than science. Given the variability in performance of harvest aids, performance issues arise each year regarding their use. This presentation will focus on the scientific aspects of harvest aid applications in cotton in an attempt to give the audience a scientific understanding of why harvest aids perform the way they do.